Port Charlotte is a wannabe reincarnated distillery project from Jim McEwan, the mercurial genius behind the new incarnation of Bruichladdich. The malts from the Port Charlotte project all date from since when McEwan took over. They are intended to be his peated expression and peated they are. The Port Charlotte series began with a 5 year old version (PC5) that quickly became legend. The next year the expression was six years old and was called PC6 and so on until 9. I've tried PC7 and PC8 and they are among the most powerful, intensely flavored spirits I have ever tasted. The PC8 is strikingly different from the PC7 on offer here - a more yellow color, more vanilla from the oak, a more mellow peat profile. My understanding is that each year is quite distinct. 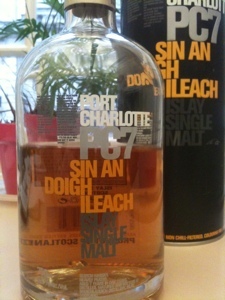 They are all very young heavily peated Islay malts bottled at a searing young cask strength. The PC7 is golden with a rosy peachy blush. When the bottle is first opened the first few drams have a very odd nose of library paste, solvent, and pork rinds - even after 15 minutes in the glass. Over time (weeks) the interaction with air mellows the nose and the solvent fades away and the library paste becomes more of an old book aroma and iodine, (the pork rinds remain). It's an odd nose - and if that was the end of the story I wouldn't have fallen in love. Entry is explosive with bean and grain sweetness joining an intense honeyed smokiness and brine and kippers. The finish is intensely long with fresh sawn wood, smoke, sea and turf joining the honey grain and smoked fish and spirity heat. The explosion of flavors is unusually intense and I want more right away. However the mouth sear from the high proof makes me slow down and have a drink of water every 3rd or 4th sip. Early on this intense young cask strength heat made me tempted to put water in it. Doing so cuts the heat but also dilutes the intense sweet salty smoke intensity that wows me. I opt for interspersing sips of water to cut the fire in my mouth and take this whisky neat. Ultimately - extraordinary. More densely flavored than any whisky I've ever tasted. The odd nose is forgiven in the face of the rich Islay malt flavor. Wonderful - but very very strong meat. "Over time (weeks) the interaction with air mellows the nose..."
Sounds like you already knew what I discovered through my experiments! Indeed. My review of Oban DE here also discusses how weeks of air transforming the bottle were necessary to my enjoyment (the first couple of glasses were too dry and closed in). If I had come to a final judgement in the first weeks I would have missed a real treat. Another example of this was Bruichladdich 17 Pedro Ximinez. In that instance I did come to a snap decision during the first week - disappointed that it seemed closed and overly dry and angry about having spent a lot on a disappointing expression. I drank it heedlessly for a while, "to get rid of it". I noticed I was enjoying it more and more but it wasn't until the bottle was 3/4 empty (about 3 weeks later) that I sat down for another critical tasting with a fellow enthusiast. We concurred that, this time, the Pedro Ximinez expression was superb. Sadly the bottle was empty moments later. I will be repeating that experiment in the future. I came by both the PX and the Fino finished versions of Bruichladdich 17 and will compare them - as the distiller intended. The point here is that, while air can downright ruin a neglected bottle, or simply diminish the charms of others through the drinking period; there are other bottles that are improved - sometimes dramatically - by the action of air and time. Fascinating! So, what's the deal? This is still kindof consistent with my findings in Ardbeg and Buffalo Trace: the sweeter notes start to show up, and the nose gets less "sharp and dry." In the Ardbeg, the sharp smoke and peat fade and the drink becomes sweeter, smoother, and the orchard fruit and malt dominate the nose. In Buffalo Trace, the dry and sharp rye and oak spices fade and the corn and brown sugar sweetness gets stronger. So maybe the trick is to ask yourself what you like in a nose when you open the bottle: is it "dry and tight" in an unpleasant way - in which case time and air may improve it - or do you enjoy the sharp notes (like some nice smoke or spice) - in which case air and time may hurt it. It's such a difficult thing to define. I'm talking about more than nose. Both the Oban DE and the Bruichladdich PX were closed in, relatively lifeless, and dry. A touch of oxidation made them floral and sweet and give them much more life. It was kind of like a new pair of high end speakers that sound constrained and lifeless and which opened up to sound glorious after a period of "burn-in". Both of those are whiskeys finished with secondary aging in sherry casks. The Port Charlotte is not, apparently. Ewan doesn't readily disclose what he's doing with additional barrel aging. In his "Black Art" expression he shows that he's willing to break the rules and go too far. Rocks has a blush and he says he uses "french red wine casks" for a "short period" of secondary aging (in his you-tube video discussion series). I don't know what, if anything, he did with secondary aging on the PC line. It's an interesting argument to detect a set of "universal effects" of oxidation. It makes sense. Oxygen is an element. It should have a consistent set of effects. Perhaps with experience we could learn to take a sip and anticipate its effects at various degrees of oxidation. This would be an epic skill of whiskey epicurianism. I wish the whisky insiders could do a little of the work - many distillers have PhDs in chemistry and distillation, seems like they could shed a little light on it for us. I'm sure many experts know more than they let on. I think that it's not only oxidation but also evaporation; the different flavor elements will volatilize at different rates, just like some of them rise to the top of a still and some of them are too heavy to do so. That's why I think Sku's experiment with leaving the bottles closed for 2 years was flawed - it was definitely not the whole story, as it did not allow the air cycling you get when you drink a bottle. Ryan, I think you are 100% correct that these changes are more about evaporation than oxidation. That's a very good point. I'm sure that evaporation plays a larger role than oxidation. I'd be very curious to see a lab analysis to identify how much of each is going on. As far as getting the liquor industry to help analyze this issue, I wouldn't expect much help. The fact that the product changes in the bottle after opening is bad for marketing. Careful analysis would probably be startling and lead people to talk about "stabilizers" and nonsense like that. When you air the whisky out do you mean cap off or On? You don't want to oxidize your whisky. You air the whisky in the glass for 10-45 minutes before drinking it. The bottle should be capped as much as possible - but as the amount of air in it increases the remaining whisky will open up. When the level gets below half full, however, you should quickly finish it or decant it to a smaller bottle to preserve it.